A basic understanding of React and Java are needed to follow this tutorial. Programming a shopping cart may not be as easy as you think. One of the greatest challenges is to synchronize the content of a user's shopping cart between devices or even browser tabs. For example, a friend sends you, via a messaging app on your phone, the link to a great deal on the latest video game that you've been dying to get. You add the game to your shopping cart, but for some reason, you prefer to go through the checkout process on your desktop computer. You log into your account and that's when you realize that there's nothing in your shopping cart. You add the video game to the shopping cart again on your phone, but nothing appears on the other side. Have you experienced this before? Are you a developer that doesn't want your users to go through the same annoyance? If so, keep reading. 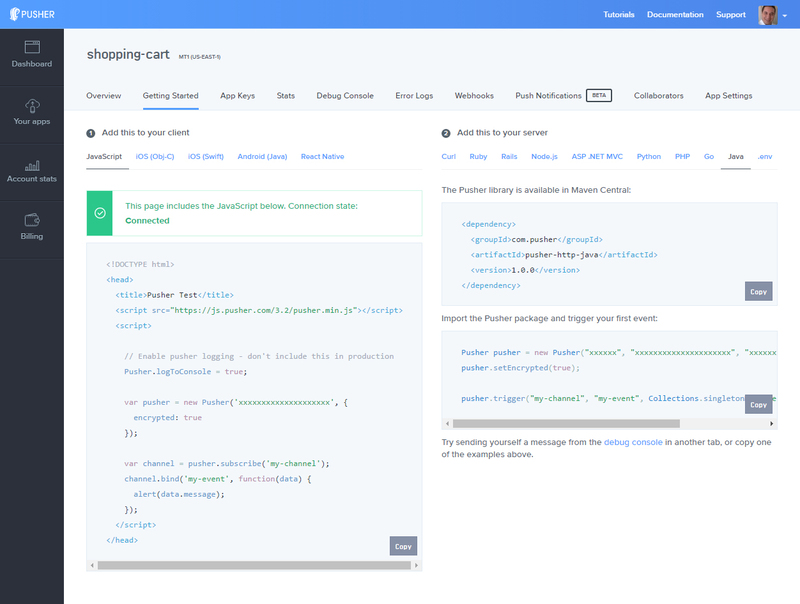 In this tutorial, we're going to build a simple realtime shopping cart, using Pusher to solve the synchronization issue we mentioned earlier. When an action like a quantity update or an item is removed from the Cart, a Pusher event will be sent so all the listening devices, windows or tabs can be synchronized accordingly. Bootstrap as the CSS framework. To keep things simple, we won't use a database. We'll keep a list of four products in memory, the app will only support one user, and the cart items will be stored in a web session. The server will provide a REST API so the front-end can work just as a presentation layer with AJAX calls. For complex applications, the recommended way to do this is by using something like Redux. In fact, in the Redux documentation you can find a shopping cart example. However, once again, to keep things simple, we are going to issue all of our AJAX requests from the parent component using fetch. This tutorial assumes prior knowledge of Java 8, Spring Boot/MVC and React. We will integrate Pusher into a Spring MVC REST API, create React components and hook them up with Pusher. You can find the entire code of the application on Github. Enter a name, choose React as your front-end tech, and Java as your back-end tech. This will give you some sample code to get you started. Then go to the App Keys tab to copy your App ID, Key, and Secret credentials - we'll need them later. 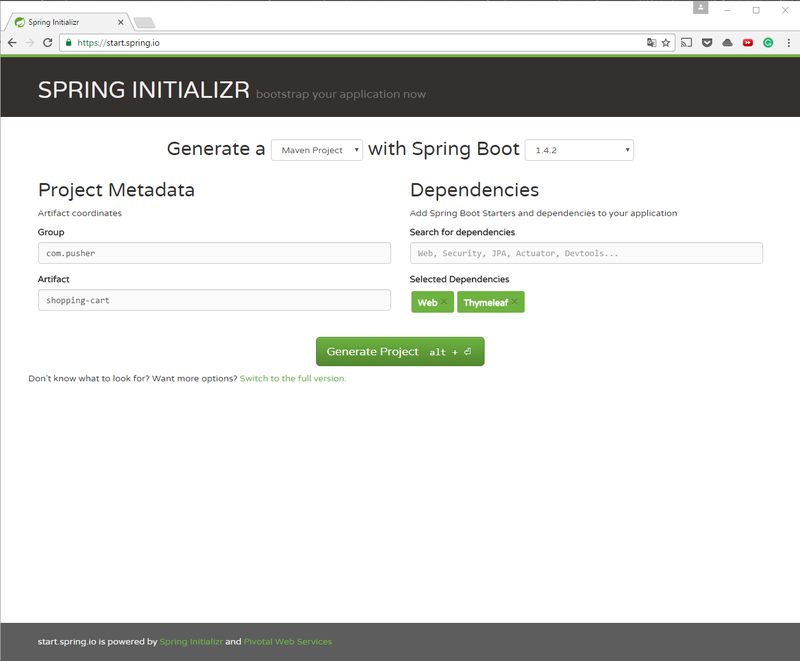 One of the easiest ways to create a Spring Boot app is to use the project generator at https://start.spring.io/. Unzip the content of the downloaded file. At this point, you can import the project to an IDE if you want. The @SessionAttributes annotation defines the identifier of an attribute that will be added to the session automatically when an object with the same identifier is added to the model object. This way, if a list of products (representing the shopping cart) is not in the session already, an empty one is created. As this application supports only one user, the name of the channel is fixed. 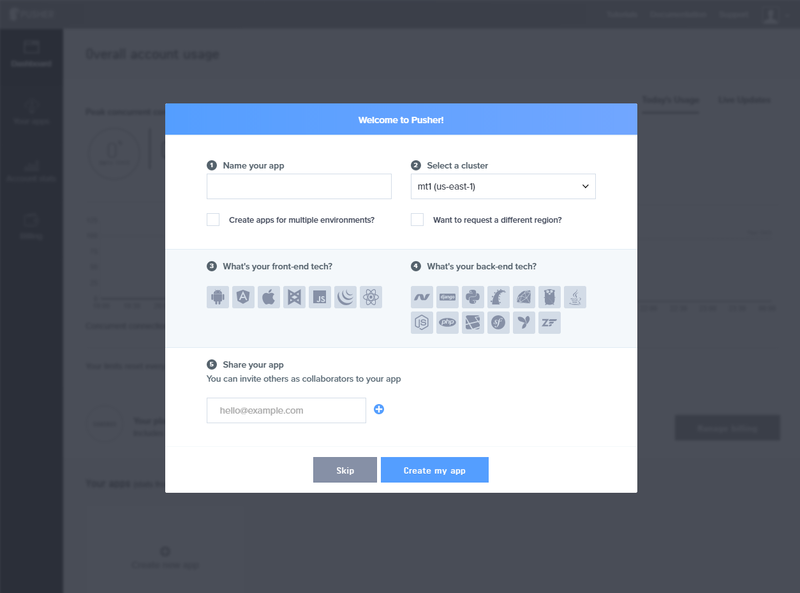 However, in a real application, the shopping cart of each user will use a different Pusher channel, so the name would have to be unique. But there's no problem, Pusher offers unlimited channels on all of its plans. static/js/header.js is a simple component without state or properties that only renders the HTML for the page's title. 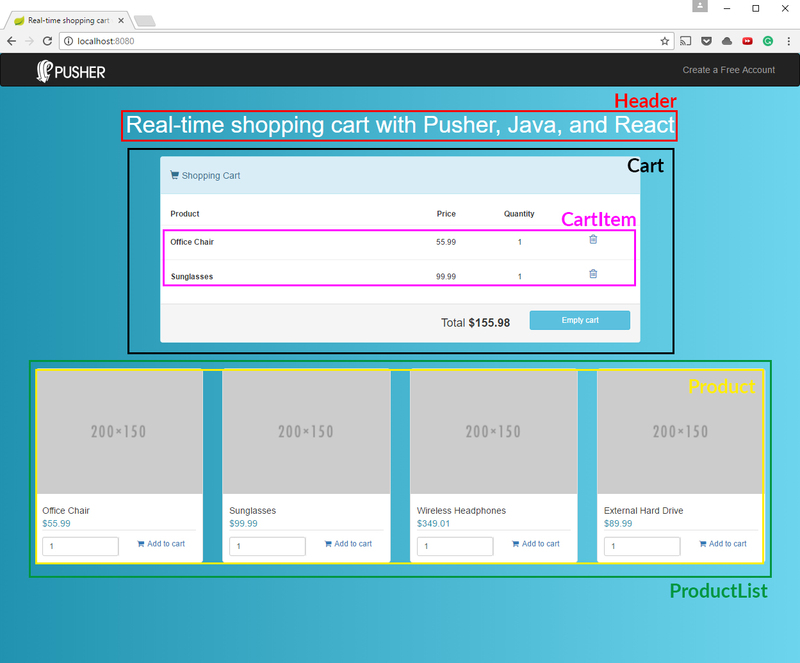 In this tutorial, we saw how to integrate Pusher into a Java back-end and a React front-end. As you can see, it is trivial and easy to add Pusher to your app and start adding new features. You can start on the forever free plan that includes 100 max connections, unlimited channels, 200k daily messages, and SSL protection. Signup now!